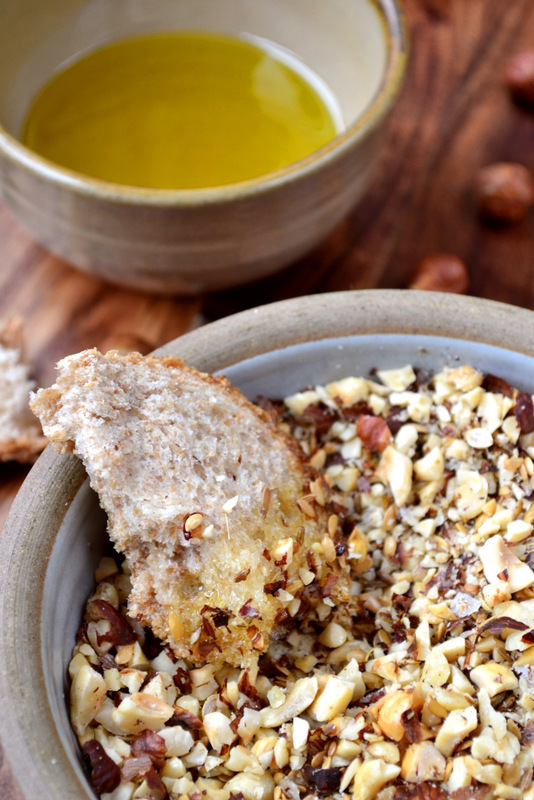 Dukkah (or duqqa) is an Egyptian dish, into which one might dip bread, which generally contains a mixture of nuts, spices and occasionally herbs. For instance, my recipe contains hazelnuts, which tends to be the norm for this side-dish. However, other potential nuts that will quite happily take their place in dukkah include, but are not limited to, pistachios and cashews. Indeed, almost any nut will work well here. Since dukkah is supremely flavourful, necessitates very little preparation and takes a surprisingly long time to disappear, even with a number of people clawing at it at once, it is perfectly suited to gatherings and dinner parties. Of course, these characteristics also make it a very effective frugal dish, a very rare trait where nuts are concerned. Still, I guess that’s the current point of my existence – to prove that one can eat well on a budget! 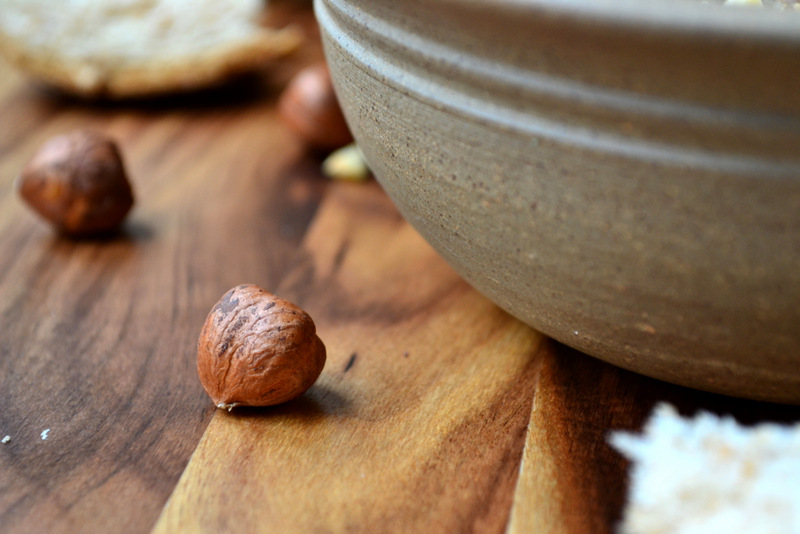 The best and most common way for you and your friends to enjoy dukkah is to take a hunk of bread, slather it lavishly with olive oil (or not, depending on how frugal you need to be) and press it firmly into the warm embrace of your freshly prepared community of nuts and spices. The flavour this stuff imparts is truly exceptional and somewhat surprising and is made all the more stunning when a generous pinch of good quality sea salt is added to the party. Whether dukkah should contain a herb of some sort, generally mint, is an interesting topic. On the one hand, one would expect a herb to feature in a traditional dukkah. On the other, however, it could be said that mint, or any other herb, detracts from the flavour of the hazelnuts and spices. I guess the jury is out on this one, though my mind is firmly made up. I do hope you enjoy this hazelnut dukkah, I shall leave it up to you to decide whether to include mint, though you know what my advice is. 1. Put your hazelnuts on a tray and roast for 10 minutes at 160C, until crunchy. Remove them from the tray and chop them finely, using either a food processor or a knife. 2. Gently toast the cumin and coriander in a heavy based pan. Transfer them to a pestle and mortar and grind until broken down but still a little coarse. Mix everything together in a bowl and dip away! Cost: If one searches in the right places hazelnuts can be had for a reasonable price. Indeed, I managed to get my hands on 200g for around £1.50, a price which seemed rather pleasing. If one manages to do the same then there’s no reason this dukkah need set you back more than around 90p. Divine. You come up with the most interesting, tasty dishes! I really enjoy your work! Wow, you’ve done it again! Thanks for coming up with the most uncommon but surely delicious dishes and sharing with us! Your photos are always so gorgeous. What type of lighting and camera do you use? Thanks! I use natural lighting with a reflector board. My camera is a nikon D3100 – nothing too fancy. sounds excellent. With perhaps a glass of port? I think I will give dukkah a go. Especially a home made one, given the cost of the off-the-shelf ones… You might like my hommus recipe I just posted. I added some cashews and YUM!!!! Not particularly frugal with the cashews in, but take them away and it’s an incredibly cheap and tasty dip to make! Hello. My name is Shannon and I am a hazelnut addict. Seriously. This recipe seems like it was made for me! I’ve never heard or seen this before, but I am thrilled you have shared it! Thank you! I have never heard of this before but looks delicious. I’ll have to ask my mil, who travels to Eygpt, if she has had this. If so I could make if for her. Dude, I’ve never heard of Dukkah, but I am very intrigued! And I certainly don’t cook enough with hazelnuts, which gives me even more motivation to give this a try. Never would have thought of dipping bread into nuts, but that looks fabulous! Thanks for sharing! I know, but it works great! This sounds fabulous! I like dukkah, but I’ve never made it; I totally should! It sounds even more delicious with hazelnuts. Also, I’ve never heard of linseeds… what do they taste like? Linseeds are very innocuous, just add a slightly nutty taste really. They’re really quite delicious. Your recipes are getting more inventive and your photography likewise. This is a cracker for me to use to start our ‘family dinner’. A weekly event on Sunday where all are welcome. It could keep them occupied while I struggle with the cooking, photography and serving. Thanks so much, Conor! Great idea for it and very simple! Fantastic!!! So simple, and I imagine it’s incredible. Plus it has that element of fun. I love fun. This is on the menu for my next party. Thank you! “Press it firmly into the warm embrace of your freshly prepared community of nuts and spices.” One word: Delish. Well, alright. It is not an actual word, but it fits. May I substitute honey? Haha – it’s almost a word. You could use honey… why not!? 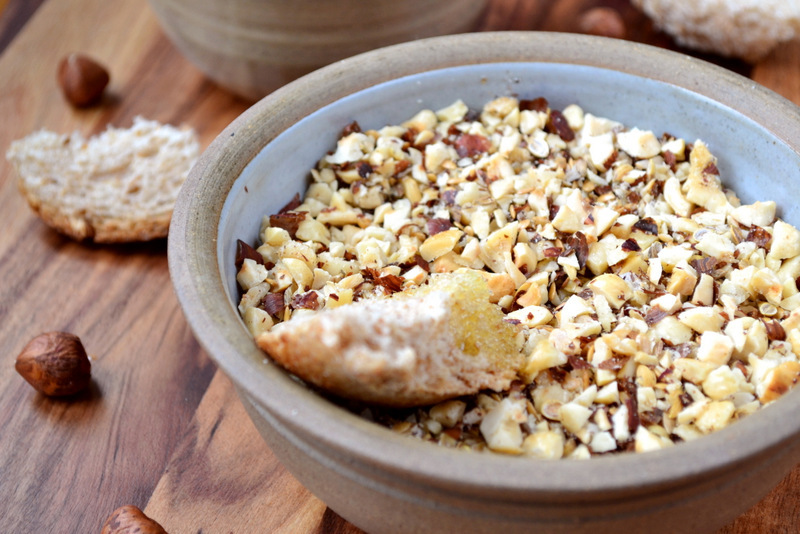 I love using hazelnuts in baking and salads – this recipe gives me a new way to use them. Thanks! I bet the cumin seeds taste fantastic in there – they’re so much better than the ground variety, IMO. I completely agree, Hannah – far nicer. I’ve never had a dukkah with herbs … agree with you in that I’m not sure it would challenge the spices in the mix. But what a terrific idea to spice up a simple baguette at a dinner party ! Definitely a great way to do so! 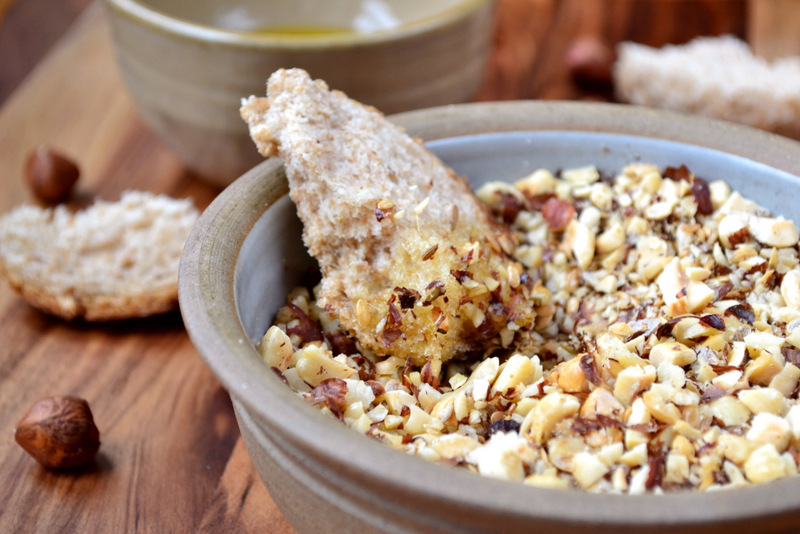 what an interestingly savory recipe with the hazelnuts and bread. I just chopped 4 cups of hazelnuts in a recipe I made this past week and just posted. How splendid this looks! (and one must never be so frugal that they decline vast amounts of delicious olive oil!) I am going to make this for my next dinner party…or lunch. Thanks for the post! Thanks! No, Katie – I quite agree. Whoa. I’ve never seen anything like this. A dip that’s made with nuts and spices?! Very cool, err, nutty. I have never heard of dukkah but it looks tasty with the hazelnuts! That sounds like a treat! Indeed! 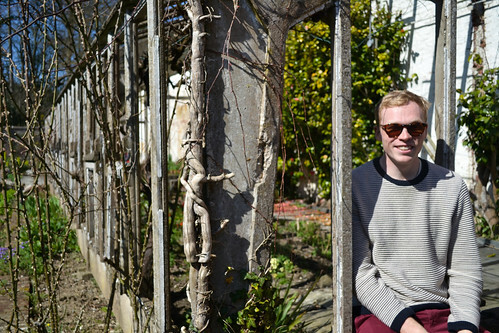 You grow your own hazelnuts? Amazing :D.
Love dukkah. Sometimes I throw in thyme leaves if I have a bunch that is about to go. That’s a good idea, Daisy! I think I’d do that too. I’ve never heard of dukkah, but this looks right up my alley. You can’t have enough hazlenuts, in my opinion. Thanks – I shall have to give this one a try! I absolutely love the whole bread, olive oil, dukkah dipping experience. I love the hazelnuts in this – looks great! thanks! Me too, we loved it. Dukkah is fabulous. As a nut lover, I like the coarser grind of yours over mine! I liked the coarser grind too. Yum I have never heard of this but it sounds amazeballs! This looks sooo yummy! And your pictures… They are fantastic! Do you mind if I ask what camera you use? At the moment, I’m just using either my iPad or a crappy little camera. I’m looking to get a good camera and just wondering what fellow bloggers who take amazing pics are using. thank you so much! I use a Nikon D3100 DSLR. It’s just an entry DSLR, but if you know how to use it you can get some great shots. That makes my mouth water just looking at it and it sounds absolutely devine. I am definitely going to have to try it out. Thank you for sharing. I like the sounds of this very much…i might sneak just a Hint of mint in, but only after I’ve tasted it without! Some great shots here Nick! Ah – thank you very much. A huge compliment coming from you! Gah! Your photos are absolutely gorgeous! Makes your recipes sooo enticing. Another great idea! I like to coat chicken, fish or lamb with dukkah before pan frying. It’s a simple step but gives the finished dish a sophisticated look, and of course the hazelnut smells amazing. Ah, not a bad idea at all! I could never buy something like this from a shop I’m afraid – it’s so simple to make. Great idea though – I’ll have to coat something in it! True – it’s simple, indeed. I don’t have all the spices at the ready, so the store-bought version seemed pretty appealing. I can see the value in stocking up and making your own, though, so I’ll be doing that soon! Thanks for the recipe. No problem, Emily. As a rule I try to make everything myself, it allows you to control exactly what goes into something. Simply delightful! I’ve heard of this from one other blogger, but he didn’t really explain what dukkah was. Ahha – well hopefully I helped. Delightfully simple recipe and a Wonderful Blog! Question: What do we do with the 3 tbsp sesame seeds or linseeds? This ingredient does not figure in the Method Section of the recipe. Thank you! Sorry if that wasn’t clear – that’s included under the ‘mix everything together’ bit!